Disclaimer: The information contained in this post is accurate for LSCWP v1.8.3 [release log]. If you are using a newer version of the plugin, some details may have changed. Please refer to our wiki for the latest! You asked for it, and we delivered. LiteSpeed Cache for WordPress now supports Object Cache! What is an Object Cache? An object cache stores the results of expensive and/or frequent database queries in a way that makes them easy to retrieve, and eliminates the need for repeated access to the database. Object caching greatly reduces the time it takes to retrieve query results. 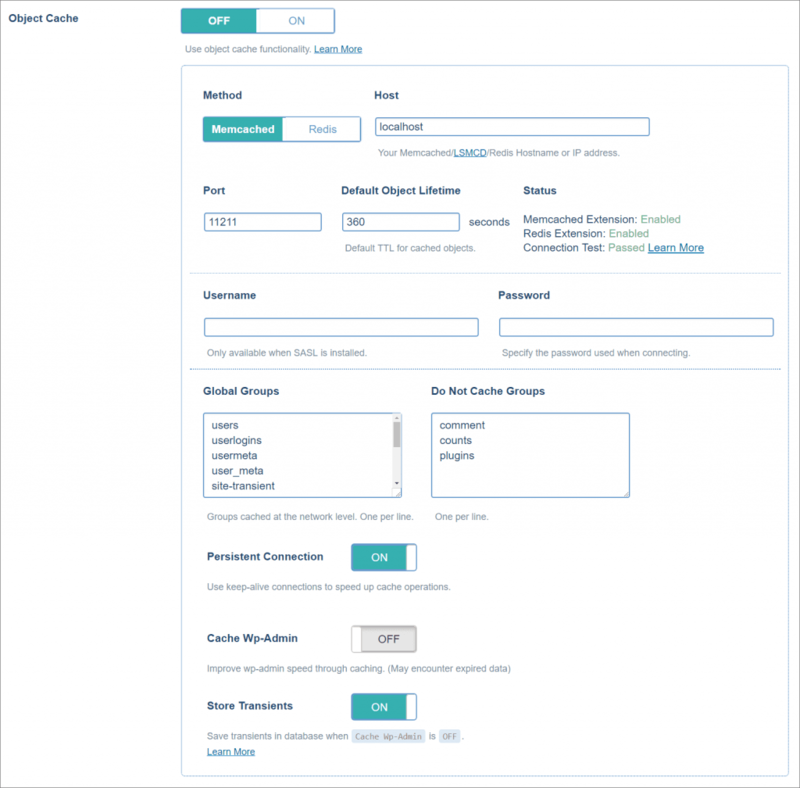 For example, WordPress stores your site’s options in the database. Site options include things like the site’s name and URL. Every time WP assembles a page for a visitor, it is necessary to access the database to read the site options. As you can imagine, these repeated queries for the same information represent wasted resources. With an object cache, you can query the database once, and save the results for a set period of time. During that time, whenever a page must be assembled, WordPress can get the site information from the object cache. Accessing object cache is a much less resource-intensive prospect than accessing a database. Some queries are time-consuming, and other queries are repeated frequently. Both of these scenarios can be improved by storing the query results in object cache. Note: If you have a site that is fully-cached by LSCWP, object cache won’t be invoked very often. Object cache is only necessary when WordPress is building a page through PHP. If PHP is not being called (and minimizing PHP usage is the goal with LSCache, after all) then there are no queries to process and therefore nothing to look up in object cache. LSCWP doesn’t provide object caching directly. Rather, it supports your use of an external object cache such as Redis, Memcached or LiteSpeed’s drop-in Memcached replacement, LSCMCD. Setting up object cache systems is outside of the scope of this tutorial, but you can find some useful information via the product links above or by visiting our wiki. So, assuming you are already using one of these object caching methods, you can set up LSCWP support in the Cache Settings tab. Navigate to LiteSpeed Cache > Settings > Cache and scroll down to Object Cache. (Make sure you are in Advanced View, or the Object Cache settings will not be visible.) 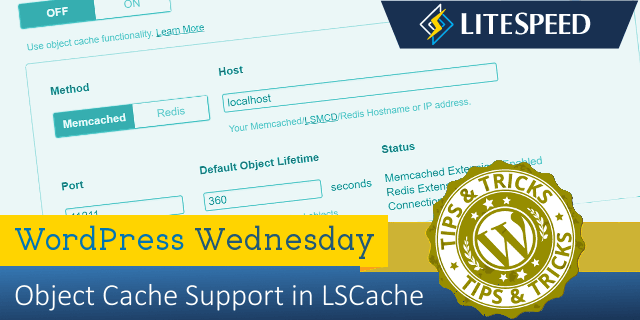 You will need to give LSCWP some parameters, including where your Redis, Memcached or LSMCD lives, which objects you’d like to have cached, and how long you want objects to remain in cache, among other things. NOTE: In the imminent LSCWP v1.8.4, Object Cache settings are moving to a new tab. If you are running v1.8.4+, please Navigate to LiteSpeed Cache > Settings > Advanced to access the following settings. Object Cache is disabled by default. Select ON to enable it and then configure it via the settings, as described below. Choose Memcached if using Memcached or LSMCD. Choose Redis if using Redis. These settings refer to the hostname (or IP address) and port number used by your object cache. The default values of localhost and 11211 should work fine for you, if your cache is set up via a TCP connection. If you are using a UNIX socket, Host should be set to /path/to/memcached.sock (substitute the actual path used for your installation) and Port should be set to 0. Choose a TTL for items stored in the object cache. We recommend using a relatively short time in order to avoid stale results. Default is 360 seconds. This is an informational area to let you know the status of your external object cache. If you are getting errors here, please see How to Debug your Object Cache Setup. These settings may or may not be available, depending on your object cache setup. If you see any of these fields, fill in the appropriate credentials. Doing so will prevent cross-contamination in situations where one object cache is shared among multiple sites. If enabled, the connection is kept alive in order to make Memcached faster. This is set to ON by default. If enabled, WordPress admin will be sped up, but at the risk of occasionally retrieving stale data from the object cache. This is set to OFF by default. When Cache WP Admin is set to OFF, transients have nowhere to go. Without transients, you don’t receive server status notices (such as XXXX has been completed successfully.). Enable Store Transients to get server notices when Cache WP Admin is disabled. Why do You Need LSCache for This? You may be wondering: what is the point of setting up object cache support in the LSCache plugin? So here’s the thing: you can’t use object cache without telling WordPress how to handle it. You need a plugin for that. You can install a single-purpose object cache plugin, or you can let LSCache facilitate the relationship between your object cache and WordPress. It comes down to this: would you rather install several plugins with many different interfaces to handle all of your optimization needs? Or would you rather have one optimization plugin that can handle it all? If you like the second option, then LSCache is your solution! I am using these plugins but suddenly the following problems have come up, how to correct it. I’m not able to open the WordPress admin dashboard. Please create a ticket through our client area or by sending email to support@litespeedtech.com. Thanks! Thank you for this tutorial. I managed to install redis and predis on my dedicated server ( CloudLinux 6, Litespeed Webserver Enterprise” while creating two instances as a start. I opt to utilize dedicated instance per cPanel account on the server to prevent cross contamination. The connectivity tests for both instances were successful. but I’m stuck at the the database ID and password i must specify on LS wordpress cache configuration page – I understand that the ID must be between 0 and 16 but is this limitation per cPanel account and so per Redis instance or is it on the whole server – as for the password was i supposed to specify it during Redis installation or on redis.config “that i am being able to find” before pasting it into LSWC. My apologies for these questions but i am new to Redis. I cant get it to turn on or even show its tested. If i uninstall and reinstall plugin the connection test works for the first view but i have sockets enabled so the settings it tries arnt right. If i enter the right ones and hit save it reloads to totally blank fields where i had entered settings. Connection test “not available”. nc -U /path/sockname.socket works so it apears to be an issue with the plugin, any suggestions? is it possibly something with openbase dir (along the lines of the server cant access the path?) Ive tried ln -s and moving it one step bellow doc root but that didnt seem to change anything. Hmmm, our support team will need to look a little more closely at your setup. Please create a ticket through our client area or by sending email to support@litespeedtech.com. Thanks! im running olsws… does that change anything or is this something they would want to see anyway? Hi, I am using LS Cache version v2.1.1.1. I can’t found Object Cache in my advanced tab, only 2 option in there : Improve HTTP/HTTPS Compatibility and Instant Click. Where is Object Cache option location? Hi, Zakki. It sounds like you are on WordPress multisite? If so, you can find the Object Cache settings in the Advanced tab at the network level. It can’t be configured from within an individual site. Forgive the cache newbie question, but can you explain where the list of groups is coming from, and how do I know they are correct for my site? Our object cache implementation uses WordPress’ object cache interface and then stores the results with your Redis or Memcached backend. Without getting into a whole lot of technical details, I can tell you that WP itself comes up with the group list. This is one of those things where the default value is fine for 99% of the people who use it, and if you don’t know what it is, then you shouldn’t need to change it. In the event that you do want to know more technical details, you can take a look at this page of the WordPress Codex where they describe the elements of their object cache interface, including the purpose of groups. There is a link there to their source code, if you really want to dig into it. I hope that clears it up a little bit. If not, let me know!